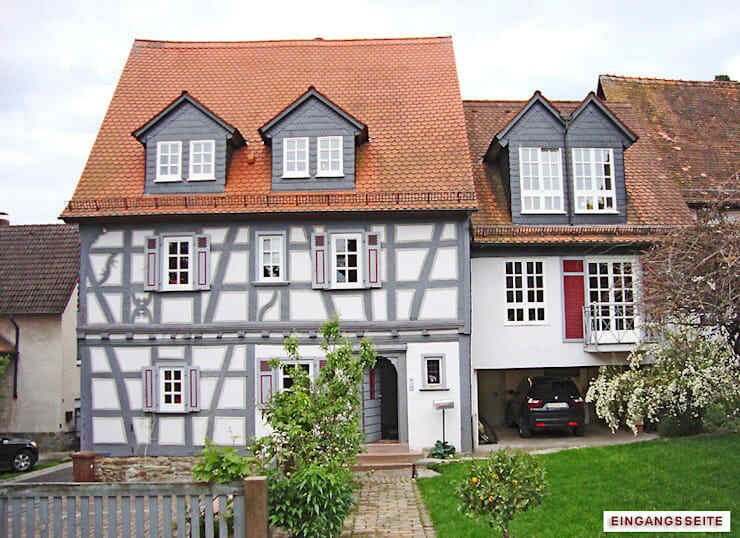 For today’s home tour, we invite you to the picturesque countryside of the German town of Bad Soden am Taunus. Amidst the green meadows and beautiful farmhouses that dot the landscape is a half-timbered house that we would like to explore today. Looking almost postcard perfect, this farmhouse with its lovely red roof and an artistic façade has received an amazing makeover. Come and have a look at this home, designed by the very competent team of architects at Architekturburo Hans Jurgen Lison, and marvel at the rustic charm and its almost magical looking contours. One of the first things that catch our eye is the unusual façade of this house, which is a combination of two houses actually. The terracotta shingles on the roof and the transom windows peeping from the towers in it, as well as the timber detailing on the white walls create a whimsical feel and yet retain the vintage German character. But the most eye catching detail has to be the random grey lines criss-crossing the surface making the façade look almost like a painting. These half-timbered homes are a treasured architectural style in Germany. 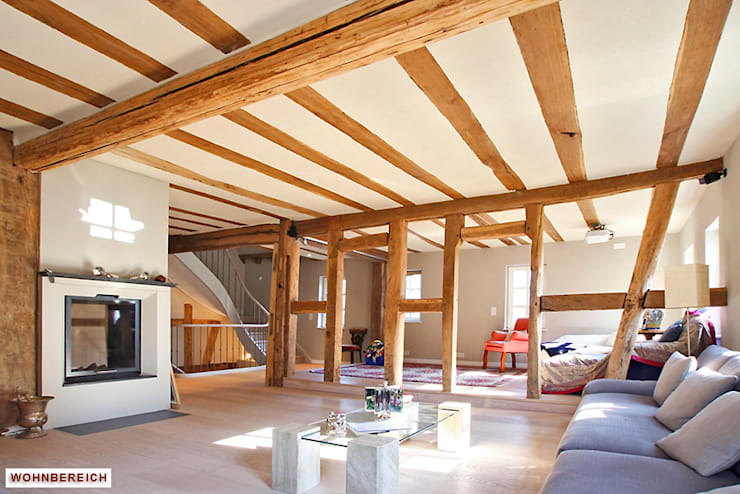 While the living room has all the basic, modern amenities for comfortable living, it’s the raw touch of the wooden beams and columns that crisscross the roof and room that lends a certain warmth and character to the space. The room is also blessed with loads of natural light that makes it look welcoming and refreshing. The comfort element is also underscored by the fireplace and the blue sofa which also adds a modern touch. The study and library of the home are well-stocked areas that have floor-to-ceiling shelves. These are placed in a way that creates corners and nooks to make the space seem cozy. The volumes invite us to spend a few hours in the land of well-crafted tales while the exotic rug in burgundy gives the space a rich look. The bathroom is done up with neutral colours like cream, white and beige with a hint of black to line the bureau holding the sink. 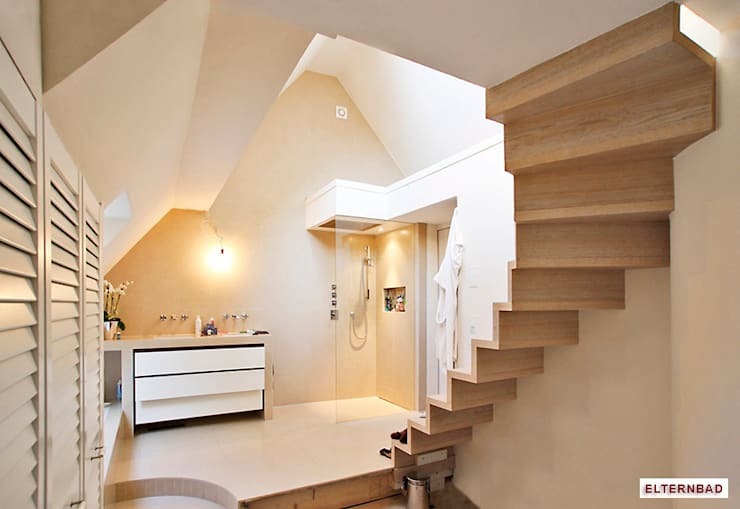 The random dips of the ceiling give it a wavy look and the steps curve to a side as an unexpected surprise. Shutters on the windows nearby keep the old school vibe alive. 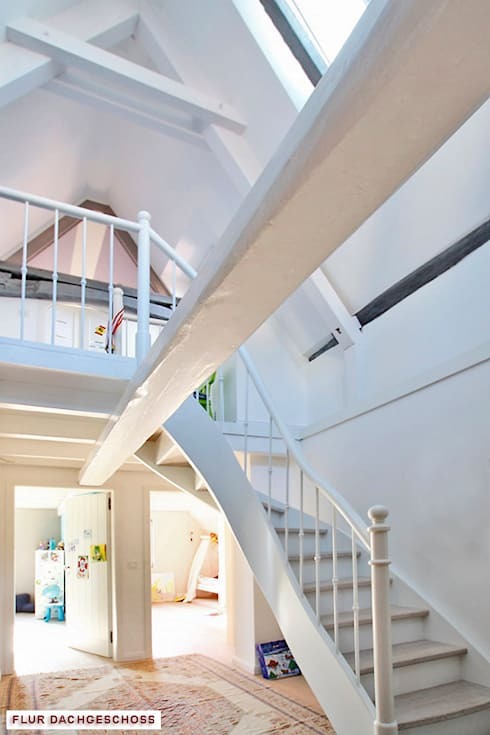 The fairy tale truly comes alive with the attic opening up to reveal two rooms tucked under it. On one side, we can see the entrance to a little girl’s room, her toys neatly stacked against the colourful cabinet in the corner. White reigns supreme in this space and gives it all a raw yet dream-like appeal. We finish our tour in the wine cellar, which is infused with a golden, dim light that makes the space seem even more mysterious. The stone steps leading into its bowels create an aura of fun while the wall has enough storage for the many bottles of wine. 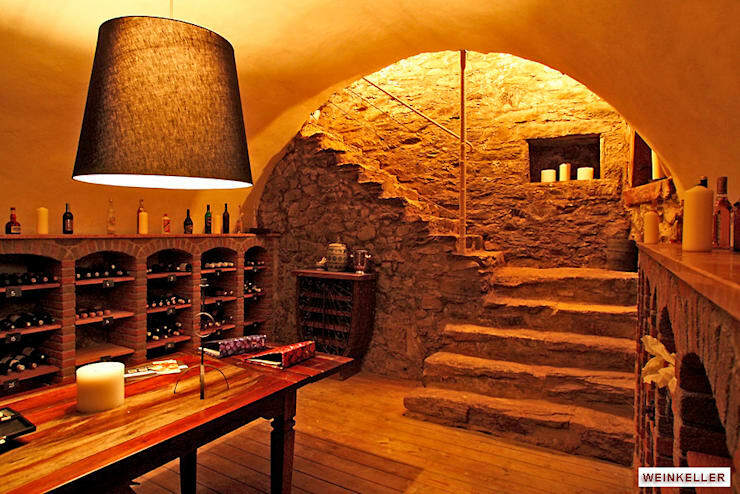 A long tasting table is also laid along the centre of the room with a large lamp trained over it. Now who would ever think of leaving without a sip of wine on this table along with a jolly good conversation? Overall, we love this home, which has a fairy tale look, thanks to the raw appeal and open quality of its design. Feeling patriotic. Embrace your inner Canadian & Celebrate Canada through decor! What do you like in this renovation?